When I left off the chest was built and ready for the tool storage inside. After giving tool storage some thought I decided on having 3 sliding tills, rear moulding plane storage, front saw till, and tool rolls hanging on the front wall. Nothing really new, but I think my tool roll idea is. 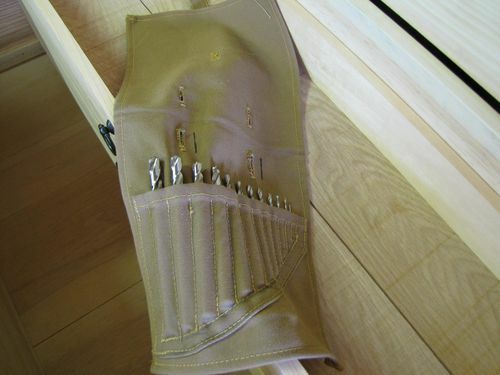 When trying to come up with ways to store drill bits and/or chisels on the front wall of my chest I came up with an idea involving canvas tool rolls. What I have is nails driving into the front wall of the chest every 3”. Then I made tool rolls for auger bits and twist bits with holes every 3”. Now I can hang my drills where I have easy access, but I can also take the rolls off the wall and roll them up for storage. Once I get a full set of bench chisels I will make a roll for them as well, so I can have quick access to them. Being able to quickly and conveniently move tools on and off the front wall makes the chest a lot more user friendly. If I am doing a project involving a lot of drilling (ex. windsor chairs) then I can have my augers accessible. If I am doing cabinet work I can have my bench chisels accessible. 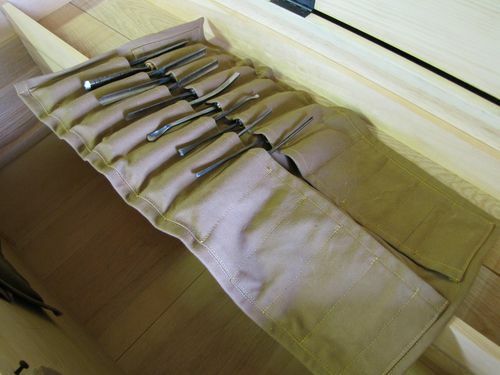 I also made a tool roll for my carving gouges, but I did not make holes to hang it up (whenever I carve I prefer to have the tool roll on the bench in front of me anyways). Of course this idea can be used to hold all sorts of other tools as well. 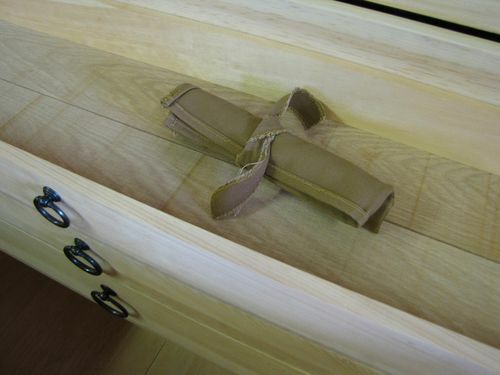 I think you could also have tool rolls on the inside of the lid, as long as they were held on by nails at both ends of the roll to keep it from folding. I think the only downside to this storage idea is that you have to know how to sew, or know someone that will do it for you. With the front wall of the chest sorted out I began making the sliding tills. The top two tills are about 2 3/4” deep and the bottom is 4 1/4”. They are all about 9” wide. The sides are 1/2” thick with 1/4” thick oak bottoms on the top two tills and 1/2” bottom on the lower till. I would have posted pictures of the drawer construction, but my computer was refreshed and all the pictures are gone. But here is what the finished tills look like in the chest. The bottom of each till is made from two pieces of white oak with a ship lap joint in the middle to allow for wood movement. The bottoms are nailed on. At the bottom rear of the chest I have a space for moulding/joinery planes. And at the front I have a saw till for three hand saws. For now at least, that is all there is to the tool storage inside my chest. Once I get a tenon and carcase saw I will make a space in the front right of the saw till to hold them. 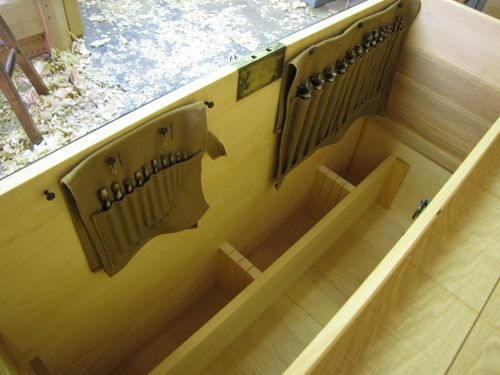 I also plan on storing a framing square, turning saw, and perhaps drawknives on the inside of the lid. 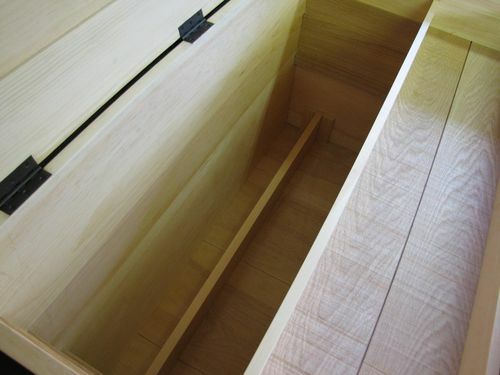 That is why the top till is 1 3/4” lower than the top edge of the chest, to allow for tools hanging on the lid. When those changes are made to the chest I will write about them. But for now the chest is done and ready to be filled with tools. what saw would you buy first? a sash saw or a tenon saw, and why one over the other? this is what i’ve been pondering lately. keep up the good work. Curt, that’s a nice chest. I have thought about a tool chest but think I am going with a set of tills and a wall mounted chest like the Studley chest only a bit less fancy. I have a hard time bending over , over and over again. So I will make my wall mounted chest to be able to be carried as a unit when full of tools. I estimate the chest will weigh over 200 pounds and that does not include the hand plane till that is separate. or the two Saw tills. 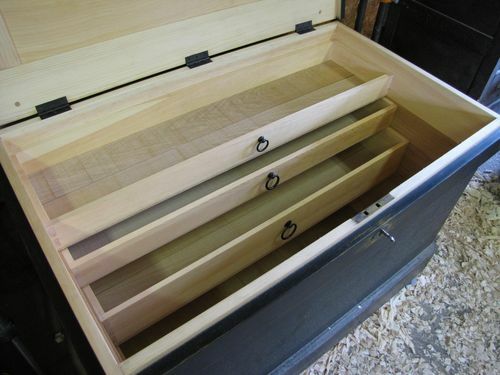 Did you base this chest on the one Schwarz did in the Anarchist tool chest? As always your work is great. Keep it up your a beacon for a whole new generation of skilled craftsmen. The hanging of tool rolls is an interesting idea. I am just afraid one could injure his hand on the protruding nail heads when reaching for a saw. As an alternative, you could sew multiple layer of canvas like making a waistband and sew buttons on it. Then you could nail this “waistband” with the nails flush. The tool rolls would be hanged to the buttons. There are also systems whose name I don’t know with a kind of half ring that you turn with a quarter of a turn after passing it through the buttonhole in order to lock it . You could also use Velcro. Or, after those byways, ... you might directly srcew nice rounded wooden buttons made on the lathe. i like the tool roll idea, but catching them on your arm was my first thought to. If its a problem, maybe move them to the back. Once this beautiful thing is full of tools, you and whose army is going to move it? I think it might be more than two sturdy people could handle. ???? Looking good! I’m always excited to see what tools you’re building. Have you considered building your sash or tenon saw? doordude – I think a 14” sash saw is the saw I use most. The length, weight, and filing of the teeth make it a great all-around user. @thedude50 & @tsangell – I will be getting both saws at the same time because I will be making them. I plan on buying the spring steel and saw nuts and building the saws to my own sizes and specifications. If I had to get one or the other though I would get a tenon saw because it is larger than a sash saw and has rip teeth instead of cross cut. 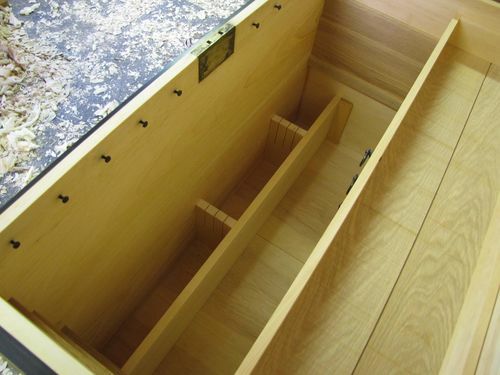 @Dan Krager – The chest without tools is fairly heavy, I can’t image it with all the tools. But the chest does have 4 casters on the bottom so it can be rolled around if it needs to. I have been using my chest for a little over a month now and never even thought about catching my arms or the saws on the nails. When the tool rolls are on the nails then there is no concern anyways. The nails are about 1 1/2” down from the top edge of the chest and stick out only about 3/8”, so your arms really don’t come near them. Plus the heads on the cut nails are not sharp. If the idea of nails sticking out really keeps you up at nights, you could always turn little wooden knobs instead so there is no worry. But honestly, until you folks mentioned it I never thought about injuring myself or my tools on the nails, and I have been using the chest for about a month. How do you move it around? Be sure to post updates on what you put in it. 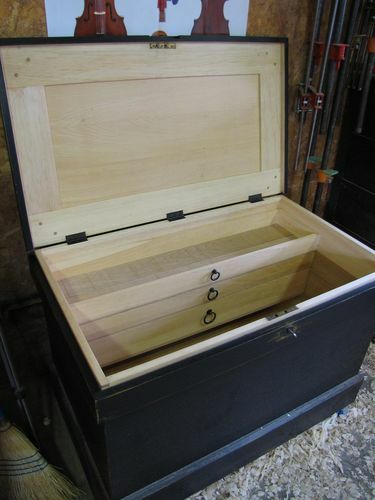 Wonderful tool chest well thought out and skillfully built. Coincidentally I happened onto your excellent wooden screw tutorials on Youtube this afternoon, so I thought this would be a good opportunity to thank you for your willingness to share your skills with others. This about a sash saw is that is does both rip and crosscut. It is a trade off you don’t rip as good a s a rip saw and you don’t cross cut as good as a crosscut saw.However, the saw is adequate for both. I just had my saw re plated I don’t have time to do everything myself so Joe did it. I know its good to go. On Britts saw blog he tells you a load about sash saws and I already have a tenon saw and a crosscut saw. I want to find more vintage tools to set up to my liking and I will do just that as I am able. Curt my question was did you build the chest based on Schwarz Idea in the Anarchists tool chest book? I love the box and wish I had made one 25 years ago. I am old now and my tools need to be up high. so i don’t have to bend over all the time to pick them up. Again well done Curt . Yes the chest is based off the one in Chris Schwarz’s book. Great chest Carter!. I like how you always go traditional but you throw in your own inovative twist with the tool rolls.